Anyone got a panettone, kugelhopf or any other soft, slightly sweet, yeasty bread hanging around at home awaiting its post-Christmas moment? 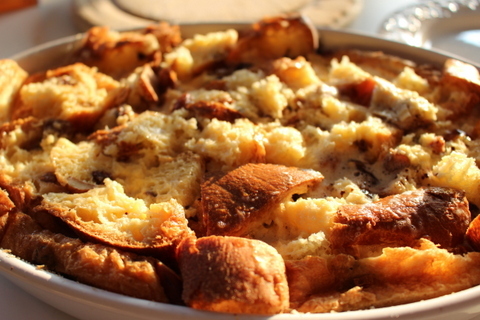 A few weeks ago Jamie Oliver wheeled out a wicked-looking bread and butter pudding featuring panettone, dark chocolate, marmalade, cream, butter, milk and loads of brown sugar. 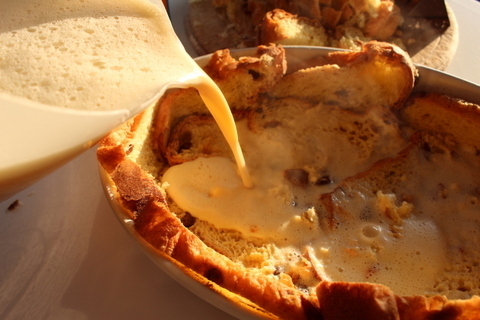 I’m not much good on rich, calorie-laden nursery puddings but – as ever – he made the dish sound completely irresistible and mildly bonkers (his title is in fact Bonkers Bread & Butter Panettone Pudding). I filed away the idea for a snowy day. Yesterday, after a fabulously frosty/sunny New Year’s Day walk, its moment came. 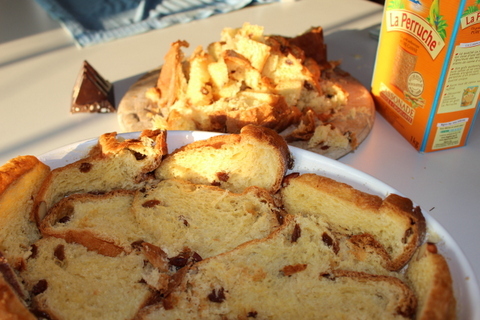 I tried a version using kugelhopf, broadly similar to panettone but less sweet – and also easier to find here in Alsace. This is an astonishingly rich, deeply gooey pudding, full of sweet-creamy-bitter flavours and soft-crunchy textures – the incarnation of comfort food. It even – don’t laugh – manages to bamboozle you into thinking it’s really quite light (something about all those beaten eggs). And it’s the very thing after a good winter’s walk (yeah well, that’s how we rationalised it). I heated the oven to 180C and then got on with the prep work: I used a little of the butter to grease an oval ovenproof dish about 23 x 33cm and sprinkled in some raw sugar (cassonade in France – use whatever you have in the way of non-white sugar in your neck of the woods) and rolled it around so it coated the bottom and sides of the dish. I tipped out any excess and earmarked it for the top of the pudding – what my Aunt Kate used to call “a nice bit of grit” (aka a shower of crunchy sugar added on top of something that already has sugar in spades). From the kugelhopf I cut enough1-cm slices to line the bottom and sides of the dish. The rest I cut in chunks. Next the custard: I put the rest of the butter in a saucepan with the cream and milk, heated it till the butter melted and set it aside. I cracked the eggs into a large bowl, sprinkled on the sugar and beat like crazy with a hand-held mixer till good and fluffy. Then I added the hot creamy mixture and continued beating for a few seconds. About one-third of the custard went into the bottom of the dish over the kugel slices, which slurped it up gratefully (one of the reasons I think kugel works even better than panettone is that it’s always a bit dry). 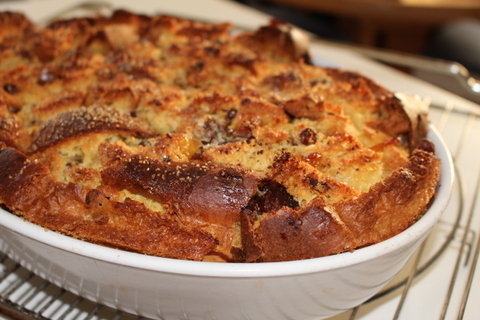 Then came a scattering of Toblerone pieces and globs of marmalade, plus a layer of kugelhopf chunks. 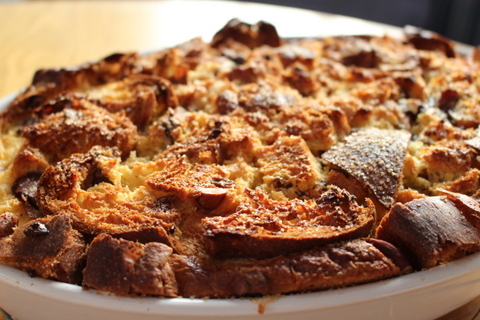 This was followed with more custard and the remaining Toblerone, marmalade and kugelhopf. I finished with the rest of the custard, pressed it all down with the back of a spoon and sprinkled the top with “grit” (the reserved sugar). Into the oven it went, emerging about 25 minutes later in all its gleaming golden glory, nicely risen and just firm in the middle. Small pieces of Toblerone had stuck their noses above the parapet and leaked lasciviously into the top layer. My kugel pudding sat in the laundry overnight (don’t refrigerate it unless you’re planning a longer wait or it will set firm and hard) and next day I warmed it ever so slightly to serve (cool oven, about 150C). JO suggests serving with ice cream, or whipped cream or even crème fraiche but I think that might just be overdoing it…don’t you?